Recently I came across a hashtag on Instagram that was #journalingbible -- after I clicked on it I immediately had to go get one of these neat things. Apparently they've been around for a long time but I had no idea such a cool thing existed. Its a normal bible, I chose ESV at mar del just because I always get the NIV version and I don't believe there's anything wrong with different versions of the word. There is space on the outer edge of each page that allows for lettering, painting, coloring and doodling. I first saw the journaling bible on my friend @stephanieackerman1 's feed because @megduerksen said I needed one-That led me to @shannanoel and I haven't looked back since. I'm in love with this adventure and challenge to doodle a page everyday, that's my goal not theirs but it's a great goal in my opinion!! DO I USE WATERCOLORS? yes, I buy cheap ones from Michaels that are for kids. They are in a plastic white tray.. Nothing fancy. I'm love cheap art supplies, the most expensive isn't always the best. DO MY WATERCOLORS BLEED THROUGH? they don't, mainly because I don't use a ton of water. Less water is better when it comes to this project. IS THE BIBLE PAPER THICK? its not super thick but it's more thick than a normal bible. If you used a sharpie it would bleed..
DO I WRITE WITH A BRUSH OR PEN? A pen-for my Journaling bible I've chosen MICRON AND FABERCASTELL. Those two are my go to pens. WHAT MARKERS DO I COLOR WITH? I use light shades of Faber castell Pitt pens. They don't bleed although I'm sure it would if I used black to color with. AM I DOING A BIBLE STUDY? I'm not, I am just picking a page, reading it, and then studying that page and writing what it means to me. DOES THE WATERCOLOR CAUSE WRINKLY PAPER? Yes, watercoloring always causes warp. That's just part of it, but... My bible has an elastic strap to keep my bible closed so once it's dry I shut my bible and let the pressure flatten it back out. 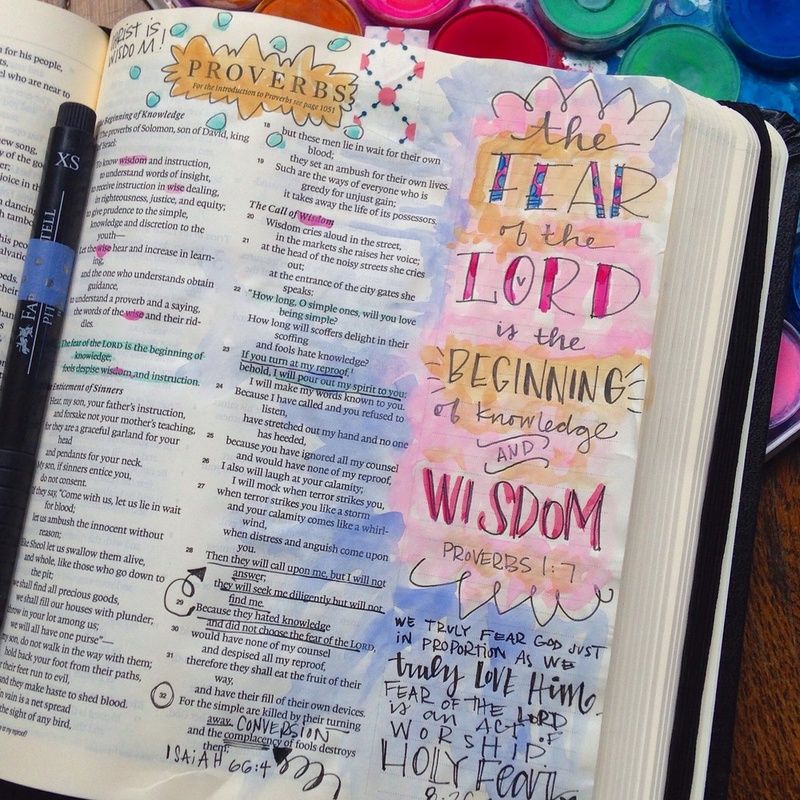 DO I USE CRAYONS IN MY BIBLE? I haven't yet but probably will soon, I use Crayola Twistable to do all of my highlighting. i think that was all of the questions. This is a fun journey and hopefully you'll join me in making bible reading way fun and take a picture to show me!! Post it on your Instagram or Facebook and show the world too, there can never be too much Jesus on social media if you ask me! And, for those of you who wanted tattoo pictures, this is the best I can do..
Posted on August 29, 2014 by Valerie Wieners.